Starting with (the pAsuram of ) ‘piLLAn nanjeeyar [upadhEsa raththina mAlai – 39]’, as he (maNavALa mAmunigaL) wanted to, he showed about those who authored vyAkyAnams for dhrAvida (thamizh) vEdham that is thiruvAimozhi, and about the count lengths of those vyAkyAnams; and now regarding the other prabandhams that are related parts of thiruvAimozhi, he is divining who all authored them, and that periyavAchchAn piLLai divined vyAkyAnams for all of them. 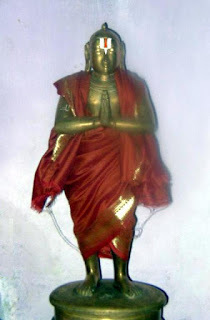 periyavAchchAn piLLai – Since there are his divine son nayanArAchchAn piLLai and nAlUrAchchAn piLLai, here he is specifically mentioning periyavAchchAn piLLai. ariya aruLichcheyal poruLai – As said in ‘ariya innisai [periya thirumozhi 1.2.10]’ (hard to sing), and in ‘aRiviththEn Azh poruLai [nAnmugan thiruvanthAdhi – 1]’ (shall start saying about the deep meanings), this is how the difficulty/greatness of meanings of dhivya prabandhams is. still, it is difficult to determine the meanings, isn’t it? Having such difficulties and greatness (arumai perumai), the meanings of aruLichcheyal (dhivya prabandhams), ‘Ariyargatku ippOdhu’ – for the AchAryas after (periya)AchchAn piLLai , or, ippOdhu – also – after he divined the vyAkyAnams, or, for those living at the same time as him, since he divined (earlier) at that time, it is being possible for latter ones to divine/explain them. As said in ‘ariyadhu eLidhAgum [iraNdAm thiruvanthAdhi – 22]’ (what is difficult would become easy), due to the grace of periyavAchchAn piLLai, ‘aruLichcheyaLAyththu aRindhu’ – that is, by his extraordinary vyAkyAnams, for meanings that are very hard to know, it is now possible for others to understand, enjoy it themselves, and divine as advice to others. Compared to other AchAryas, isn’t this the distinguishing greatness of him (periyavAchchAn piLLai)? This entry was posted in Other, upadhESa raththina mAlai and tagged 74, annan, ariyar, erumbi, erumbiappa, kovil, mamunigal, manavala, pasurams, periya, periyavachan, pillai, rathina, rathinamalai, raththina, raththinamalai, upadesa, upadhesa, vachchan, vyakkiyai on January 17, 2016 by raghuram.